Making a transcontinental plane flight in only thirteen hours was quite an achievement when this film was made in 1936 — but it was not impossible, as indicated by Paramount's last-minute decision to "downsize" the film's original title, Twenty Hours by Air. In anticipation of Airport 34 years later, womanizing pilot Jack Gordon (Fred MacMurray) is called upon to safely guide his plane through a blinding blizzard. His task is complicated by a trio of crooks who are escaping from the law after pulling a jewel heist, and by a shady nobleman (Fred Keating) who offers Gordon a large amount of money if he will land the plane before San Francisco. In the climax, one of the passengers hijacks the plane, only to be foiled by — of all people — an obnoxious brat of a youngster (Bennie Bartlett). Oh yes, and before this eventful flight has reached its conclusion, self-styled Lothario Jack has decided to settle down with one girl, wealthy Felice Rollins (Joan Bennett), who, during one of the many crises, is briefly pressed into service as Jack's copilot. Thirteen Hours by Air was produced with the technical assistance of United Airlines. 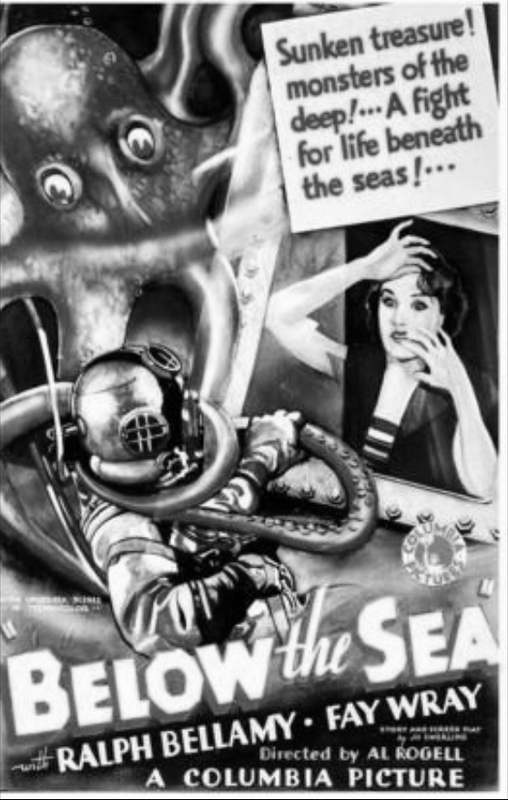 Ralph Bellamy is incongruously cast as a he-man deep sea diver in the Columbia meller Below the Sea. The plot is set in motion by former U boat commander Frederick Vogeding, who seeks out a fortune in gold and jewels which sank to the bottom of the sea during World War I. There's plenty of wet and wild action towards the end, with Bellamy battling the villains, the elements and a fake octopus to retrieve the loot and rescue the leading lady. At the time he filmed Below the Sea, Bellamy was being rushed from one picture to another at Columbia. When he took a gander at the script and discovered that it was wall-to-wall fistfighters and heavy lifting, the exhausted Bellamy insisted that he be doubled in the more strenuous scenes. Columbia president Harry Cohn agreed, on one condition: that Bellamy not tell the studio's reigning action star Jack Holt, lest Holt demand his own stunt man. From this point onward, all of Bellamy's contractual negotiations at Columbia would invariably end with Cohn screaming "And remember: DON'T TELL JACK HOLT!" In this rough-and-tumble action comedy, Chuck Connors (Wallace Beery) and Steve Brodie (George Raft) are friendly rivals on New York's Bowery in the 1890s. Connors owns a fancy tavern and looks after a streetwise kid named Swipes McGurk (Jackie Cooper), while Brodie is a daredevil willing to do nearly anything to get the better of Connors. When both men fall in love with Lucy Calhoun (Fay Wray), who has fallen on hard times, Brodie takes her under his wing and helps get her back on her feet. Connors is furious that his rival has won her heart, so he goads Brodie into doing something spectacular to prove his love for her — jumping off the Brooklyn Bridge, for example. Reckless but not stupid, Brodie has no intention of making the jump and plans to use a dummy instead, but when Connors and his henchmen show up to make sure that Brodie doesn't back down, the dare is turned into a wager, and Brodie emerges the new owner of Connors' bar after successfully making the jump. In real life, George Raft and Wallace Beery were not nearly so friendly as their characters: Raft persuaded director Raoul Walsh to hire a number of his underworld cronies as extras, which irritated Beery no end. When the two actors had a fight scene, Beery refused to hold back, and the staged fistfight quickly turned into a for-real battle royale. In the wake of such cinematic Calamity Janes as Jean Arthur and Doris Day, it comes as a shock to find a film in which the famed frontierswoman is played by someone who actually looks the part. Matronly, granite-visaged Louise Dresser stars as Calamity in Caught, an early-talkie psychological western. According to this film, Calamity is a cattle rustler, wanted by the US cavalry. Halfway through this movie the plotline turns into a sagebrush Madame X The young trooper (Richard Arlen) sent to track down Calamity is the woman's long-lost son! It took four writers to cook up this heady brew of motherly love and blazing six-shooters. Thundering action based on Tennyson's poem, with immortal charge into the valley of death by British 27th Lancers cavalry. Lavish production values accent romantic tale of Flynn and de Havilland at army post in India. Max Steiner's first musical score for Warner Brothers is superb. Balaklava Heights charge directed by action specialist B. Reeves Eason. Set amidst the tense and suspenseful world of men who transport large amounts of nitroglycerin, used to put out fires in oil fields, this drama centers on the conflict between a young med student, who has become a nitro handler to help pay his way through school, and the old trucker who hauls the deadly chemical on site. The trucker resents the young man's attentions toward his daughter because he feels that there can be no security with a man who could accidentally blow himself up at any moment. The story of Johann August Sutter, the Swiss printer who came to California, and it was on his land that gold was discovered and that set off the California Gold Rush of 1848. Escape from Devil's Island delivers exactly was the title promises...almost. Victor Jory and Norman Foster play two desperate Devil's Island inmates, bitter enemies who pool their resources and work out an escape plan. They bribe those who can be bribed, befriend those willing to be befriended, and strong arm potential "stoolies" into silence. At last, Jory and Foster make good their breakout, but their mutual hatred bubbles to the surface and ruins their clean getaway. In typical Hollywood fashion, the essentially all-male Escape From Devil's Island manages to squeeze in a female romantic interest in the form of Florence Rice. A stellar Hollywood cast gives an extra boost to the atmospheric British feature Everything is Thunder. The story involves a Canadian POW being hidden by a German citizen during World War I. The surprise herein is that the German is Constance Bennett, one hundred percent sympathetic and (eventually) apolitical. Douglass Montgomery is the prisoner, first discovered in Connie's bathroom while the police scramble through her apartment building. Despite the possibility of being liquidated as a traitor, Ms. Bennett, who has a remarkable propensity for disguise, helps the likeable Montgomery reach the allied lines. The pro-German sentiments in Everything is Thunder (and in the Jocelyn L. Hardy book on which it was based) were not all that uncommon in 1936 Britain; funny, though, how this film disappeared from circulation in 1939. Clearly inspired by the success of Goldwyn's Barbary Coast, Warner Bros.' The Frisco Kid stars James Cagney as turn-of-the-century opportunist Bat Morgan. Heading to the gold fields of California, Bat is almost shanghaied in San Francisco but manages not only to escape his would-be captors but also to kill the infamous crime lord Shanghai Duck (Fred Kohler Sr.). The grateful citizens enable Bat to rise to wealth and power on the Barbary Coast. But he's less lucky in love, and it is his seemingly hopeless fascination with Nob Hill debutante Jean Barrat (Margaret Lindsay) that may well bring about Bat's downfall. The film is a festival of cliches, occasionally enlivened by barroom brawls and rowdy musical numbers. Featured as extras in Frisco Kid were several stars and directors of the silent era, a "generous" gesture made by Warner Bros. partly to stave off the inevitability of unionized actors. The late cinema historian William K. Everson once wrote an article titled "Movies Out of Thin Air", referring to films that were comprised almost exclusively of stock footage from earlier productions. A prime example of this sort of patchwork entertainment is the 1939 Paramount production Geronimo, which though advertised and distributed as an "A" picture was largely and economically cobbled together from existing film vignettes. Essentially a western remake of Lives of a Bengal Lancer (1935), the film concentrates on the rocky relationship between crusty Cavalry general Steele (Ralph Morgan) and his shavetail lieutenant son (Richard Cromwell). The boy is taken under the wing of kindly Captain Starrett (Preston Foster), who is also occupied with bringing renegade Indian warrior Geronimo (played by Native American actor Chief Thundercloud, unbilled despite his title-character status) to justice. The fly in the ointment is treacherous gunrunner Gillespie (delightfully played as a snivelling coward by Gene Lockhart) who for a price agrees to help Geronimo decimate the local white population. Nominal heroine Ellen Drew has one of the least demanding assignments in movie history, spending two-thirds of the film in a coma after being injured in a stagecoach accident! Among the previous Paramount epics represented in Geronimo via stock footage are Frank Lloyd's Wells Fargo and Cecil B. DeMille's The Plainsman. Errol Flynn made his screen debut in this Australian feature which blends drama with documentary as it explores the infamous story of the H.M.S. Bounty. Staged sequences re-enact the final voyage of the Bounty as angry sailors, led by Fletcher Christian (Flynn), rise up against brutal Captain Bligh (Mayne Lynton), expelling the captain from the ship and eventually settling on Pitcairn Island, near Tahiti. In addition, documentary footage visits Pitcairn Island in 1933, offering a look at the place where Christian and his men took shelter and visiting with several islanders who are descendants of the Bounty's crew members. Based on the W. Somerset Maugham novel The Narrow Corner, the melodramatic adventure Isle of Fury is one of Humphrey Bogart's early starring roles. Valentine "Val" Stevens (Bogart), a reformed criminal who makes a living by diving for pearls in the south seas, gets married to Lucille Gordon (Margaret Lindsay). Meanwhile, Detective Eric Blake (Donald Woods) is sent to bust Val, but he gets shipwrecked in a terrible storm at sea. Val saves his life and rescues the ship's captain Paul Graetz. Eric falls in love with Lucille and makes friends with Val through the course of several sea tragedies before he realizes that he is supposed to arrest him. He then has to make a painful decision regarding his assignment and his sweetheart. E.E. Clive stars as Dr. Hardy, a doctor who offers frequent bible quotes and literary parables. In this adventure, a young girl is stranded in the jungle with only a tiger cub for company and grows up to be a wild woman. When an explorer gets lost in the same jungle, she rescues him and takes her to her lair. There he teaches her to speak English and to sing a song. Months pass before the fellow is rescued. Upon his return home he must do plenty of explaining to his fiance. Meanwhile the jungle girl stays behind and sings a romantic song: "Moonlight and Shadows". Advertised by Paramount as "Another Lives of the Bengal Lancers," The Last Outpost actually has more in common with two RKO releases, Friends and Lovers and The Lost Patrol. The story takes place during the Kurdistan campaign in WW I. Left to die in the desert, British officer Michael Andrews (Cary Grant) is rescued by intelligence agent John Stevenson (Claude Rains). While recuperating in the base hospital, Andrews falls in love with his nurse Rosemary (Gertrude Michael) — who happens to be Stevenson's wife! This romantic entanglement is taken care of only after a climatic battle at a remote outpost in the Sudan, with Andrews and a skeleton crew desperately fending off hostile Kurdish tribesmen while awaiting reinforcements. An early screen version of the oft-filmed tale of Wyatt Earp, Doc Holliday, and the Gunfight at the O.K. Corral, Law and Order was adapted by young screenwriter John Huston from W. R. Burnett's novel, which alters the names of the principals but few of the facts. The film opens with a montage of the settling of the West, concluding with the observation that lawless behavior soon followed in many settlements. Walter Huston plays Frame Johnson, a steely-eyed gambler whose three companions, Brant, Luther (Frame's brother), and Deadwood, form a team of sorts, wandering from town to town in search of a good poker game. Johnson's reputation as "the man that cleaned up Kansas, the killingest peace officer that ever lived" precedes him when he arrives in Tombstone, a town controlled by the Northrup brothers and their crooked sheriff, Fin Elder. A committee of lawful citizens, led by a judge, try to hire Johnson to clean up the town, but he's reluctant to pin on the badge again. Inevitably, he does, and there's a showdown that leaves a corral full of corpses. Based on Edgar Rice Burroughs' The Lad and the Lion, which had been filmed previously in 1917, this ersatz-Tarzan melodrama shifts the scene from Darkest Africa to the Arabian Desert. The treacherous Sheik Youssef Ab-Dur (Ted Adams) kills an entire expedition and among the slain is Sir Ronald Chatham (Eric Snowden). Unbeknownst to the sheik, Sir Ronald's young son (Bobby Fairy) is saved from the attack by Sherrifa (Finis Barton) and given to a kindhearted desert mystic, Hassan El Dinh (Richard Carlyle). A young adult and now known far and wide as El L'ion, young Chatham (Jon Hall) goes in search of the villain who killed his father, falling in love along the way with the beautiful Eulilah (Kathleen Burke). The Lion Man was produced by Arthur Alexander for Normandy Pictures, a Poverty Row company otherwise engaged in producing cheap Westerns. Previously filmed in 1924 by producer Sol Lesser, Harold Bell Wright's popular suspense novel The Mine with the Iron Door was again adapted to the screen by Lesser in 1936. Suckered into buying some evidently worthless property in Arizona, Bob Harvey (Richard Arlen) discovers that he may actually have come into possession of the Mine with the Iron Door, a legendary cache of Spanish gold. Teaming up with detective Dempsey (Stanley Fields) and Marta Hill (Cecilia Parker), a young woman whose family lives on Bob's property, our hero goes a-prospecting, with eccentric archaeologist Professor Burton (Henry B. Walthall) leading the way. In love with Marta himself, the jealous Burton does his best to kill Bob during the expedition, but virtue ultimately triumphs and everyone but the villain strikes it rich. Some of the background music in Mine with the Iron Door had originally been composed for 1915's The Birth of a Nation -- which ironically starred Henry B. Walthall as the hero. This suspense drama was based on a novel by Antoine de Saint-Exupery. Riviere (John Barrymore), who operates an air delivery service, is fanatical in his dedication to service, putting prompt delivery before the safety of his men or his fleet after receiving a contract to help transport the mail. Riviere's risk-taking earns him the contempt of his pilots, including Jules (Clark Gable), who, despite his misgivings, does his best to satisfy Riviere's punishing schedule. When Jules is lost after a dangerous mission, Riviere has to tell his wife (Helen Hayes) that her husband has died, but despite losing another pilot (William Gargan), Riviere responds by demanding that more pilots be called up to ensure that the letters will be delivered on time. Raoul Walsh, best remembered for his rough-and-tumble action pictures, made this film on a rare loan-out to a British studio. Jim Tracey (Wallace Ford) is an American gangster who, while on the run from the law, flees to England, where he joins the British army by posing as a Canadian. Jim and his new friend Bert Dawson (John Mills) go through training together, and they both get to know Sally Briggs (Anna Lee), the daughter of their commanding officer. While Jim and Bert vie for Sally's attentions, Jim discovers that his girlfriend Jean Burdett (Grace Bradley) has followed him to England and is threatening to reveal his true identity. Jim ships out to China with his regiment before Jean's word can get too far; it turns out that Sally is also on board the ship, but that bit of good news turns sour when band of Chinese bandits attempt to seize the ship and take Sally with them. O.H.M.S. was also released under the more American-sounding title You're in the Army Now. Adventurer-for-hire Victor McLaglen is hired by a political faction in a mythical European kingdom. McLaglen's job is to kidnap the young prince (Freddie Bartholomew) so that his employers can take over the government. The prince enjoys the experience because it releases him from the confines of protocol. When the prince is reluctantly rescued, McLaglen is thrown in prison. He escapes upon the realization that the political party he'd been working for actually plans to kill the prince and set up a dictatorship. McLaglen rescues the prince and preserves the Status Quo—and his blossoming friendship with the affable young monarch. Curiously enough, Professional Soldier is based on a story by Damon Runyon, taking a break from his "Guys and Dolls" chronicles. The search for sunken treasure provides the basis for this adventure that begins when a treasure hunter's dive is sabotaged. He is diving off the shore of a remote tropical island that is the scene of an inter island war between rival native bands. While he is underwater, enemy natives cut his air hose. He manages to survive and make it to the beach still wearing his cumbersome diving suit. The stunned local cannibals immediately hail him as a sea god. This ruse comes in handy when he finds that evil rival treasure hunters also inhabit the lush isle. The Spy In Black is the story of a German World War I submarine captain (Conrad Veidt) who is given a mission to discover British intelligence secrets. Once he arrives in the Orkney Islands, he meets up with a female schoolteacher (Valerie Hobson), who happens to be a German agent. Veidt falls in love with Hobson before discovering she's actually a double agent for the British. In America, Spy in Black was originally released under the title U-Boat 29. Although there were Westerns before it, Stagecoach quickly became a template for all movie Westerns to come. Director John Ford combined action, drama, humor, and a set of well-drawn characters in the story of a stagecoach set to leave Tonto, New Mexico for a distant settlement in Lordsburg, with a diverse set of passengers on board. Dallas (Claire Trevor) is a woman with a scandalous past who has been driven out of town by the high-minded ladies of the community. Lucy Mallory (Louise Platt) is the wife of a cavalry officer stationed in Lordsburg, and she's determined to be with him. Hatfield (John Carradine) is a smooth-talking cardsharp who claims to be along to "protect" Lucy, although he seems to have romantic intentions. Dr. Boone (Thomas Mitchell) is a self-styled philosopher, a drunkard, and a physician who's been stripped of his license. Mr. Peacock (Donald Meek) is a slightly nervous whiskey salesman (and, not surprisingly, Dr. Boone's new best friend). Gatewood (Berton Churchill) is a crooked banker who needs to get out of town. Buck (Andy Devine) is the hayseed stage driver, and Sheriff Wilcox (George Bancroft) is along to offer protection and keep an eye peeled for the Ringo Kid (John Wayne), a well-known outlaw who has just broken out of jail. While Wilcox does find Ringo, a principled man who gives himself up without a fight, the real danger lies farther down the trail, where a band of Apaches, led by Geronimo, could attack at any time. Stagecoach offers plenty of cowboys, Indians, shootouts, and chases, aided by Yakima Canutt's remarkable stunt work and Bert Glennon's majestic photography of Ford's beloved Monument Valley. It also offers a strong screenplay by Dudley Nichols with plenty of room for the cast to show its stuff. John Wayne's performance made him a star after years as a B-Western leading man, and Thomas Mitchell won an Oscar for what could have been just another comic relief role. Thousands of films have followed Stagecoach's path, but no has ever improved on its formula. Directed with customary haste by Woody Van Dyke, Stand Up and Fight is an excellent dual vehicle for veteran Wallace Beery and up-and-coming Robert Taylor. Set in the American west in the mid-19th century, the story concerns the efforts of empire-building Blake Cantrell (Taylor) to construct a railroad across the wide open spaces. Cantrell is faced with obstacles at every turn, none more obstreperous than stagecoach-line owner Captain Boss Starkey (Beery), The film traces Cantrell's progress from drunken roisterer to pioneering visionary, and Starkey's parallel transition from deadly foe to trusted friend. The villlain of the piece is slave-trader Arnold (Charles Bickford), who exploits his friendship with Starkey to Cantrell's disadvantage. Romance enters the picture in the form of Southern belle Susan Griffith (Florence Rice), who has almost nothing to do but look demure and lovely in a series of attractive period costumes. Most Tarzan enthusiasts consider 1934's Tarzan and His Mate to be the best of the Johnny Weissmuller-Maureen O'Sullivan Tarzan efforts. Certainly it is the sexiest, with Weissmuller and especially O'Sullivan wearing next to nothing for most of the film's running time. Picking up where 1932's Tarzan the Ape Man left off, the film's plot is set in motion by avaricious ivory hunter Paul Cavanaugh, who arrives in the African jungle in search of the fabled Elephant's Graveyard. Accompanying Cavanaugh is Neil Hamilton the former fiance of Jane Porter (Maureen O'Sullivan), who for the past two years has been living with jungle lord Tarzan (Johnny Weissmuller) without benefit of clergy (this is strictly a pre-code effort, as evidenced by Jane's bikini-like attire and the now-famous skinny-dipping sequence). Jane briefly entertains notions of returning to civilization, but opts for her blissful outdoor existence with Tarzan. The plot rears its ugly head again when Cavanaugh shoots Tarzan and leaves him for dead, the better to seek out the precious ivory unimpeded. Rescued by his simian friends, Tarzan races towards the elephant's burial site, where Cavanaugh and Hamilton have been eaten by lions and Jane is next on the menu. A convenient elephant stampede--heralded by that classic Tarzan ahh-ee-yahhhh-ee-yahhhh--saves Jane from the lion's fangs in the nick of time. Tarzan and His Mate was the last of MGM's "Tarzan" series to be targeted for a strictly adult audience: the remaining MGM Tarzans, made under stricter censorship guidelines, were geared for the whole family. Alan Hale Sr. plays an American navy officer who allows German sub commander Peter Erkenlez to escape prosecution at the end of WWI. But Hale soon changes his mind when he discovers that Erkenlez was responsible for the death of Hale's wife, who drowned when her ship was torpedoed. Thereafter, the gloves are off, and a terrible revenge is extracted. The Sea Ghost bears traces of the famous 1919 seafaring melodrama Behind the Door, though the villain is spared the grisly fate of Wallace Beery in the earlier picture. Laura La Plante, in one of her final starring features, is cast as Hale's peacetime sweetheart.